"This is a picture of our dog, Daddy. He is a Chow Chow / Husky mix. 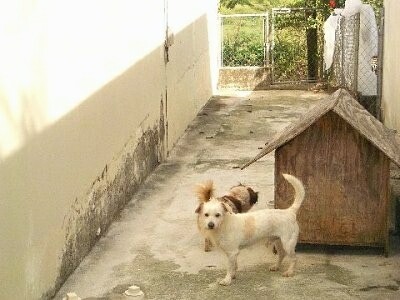 He is about 4 1/2 years old; we adopted him as a stray so we are not sure." "He LOVES playing chase with my wife and me, and squeaky toys as well...the louder, the better ;D He knows sit, shake, lie down and stay, and he LOVES doing his tricks for company, the little ham. Every time we have people over he makes his rounds to say hi to everyone; not a shy dog at all. He is a runner so we can't let him of his leash outside, though we are working on fixing that. We roller blade him for 45 minutes in the morning and run him with his backpack for 45 minutes at night." "We feel he is a very balanced dog. We LOVE the Dog Whisperer, and we have two of his books, ‘A Member of the Family’ and ‘Be the Pack Leader.’ We apply everything we learn from him and it has helped a lot. Our first two dogs were very unbalanced due to us, and after them we got his books and it is like night and day with Daddy (guess where his name is from?)." "He normally has A LOT more fur, but the summers get hot in South Dakota, so he shed a lot. The dog in the background is his new friend, Hanna the Bluetick Coonhound." 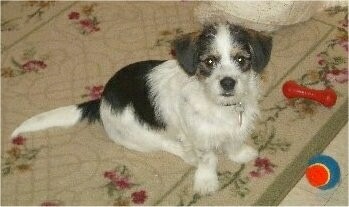 "Piper (a pleasant accident), shown here at two years old, weighs 8 lbs. She was born on Leap Day! She is a cross between a longhaired Chihuahua and a Japanese Spitz. She doesn't have the shy, nervous temperament of a Chihuahua and her legs are a little longer than Chihuahua's. She LOVES to run full out and she can jump waist high! 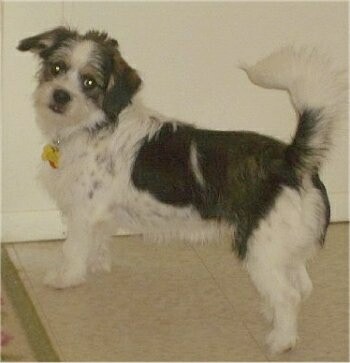 My wife says she is a ’Spihuahua.’ I say she is a ’Chitz.’ ;-)"
"Domino is a Pekingese mix. 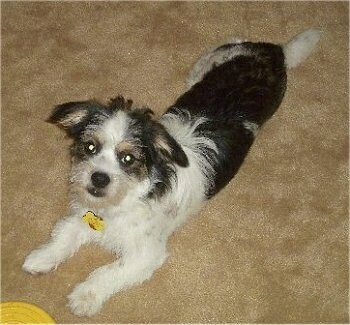 His mom is the Peke and his dad is some sort of terrier mix. 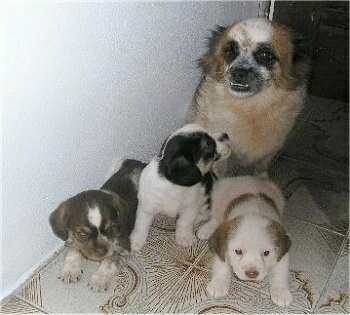 The dog pictured in front is his dad Whitey. 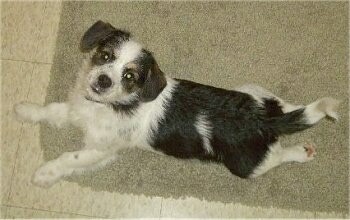 We don't really know what he is except he has random long wiry hairs and Domino has grown to have wiry hairs on his feet and face, so I'm thinking some sort of terrier mix." 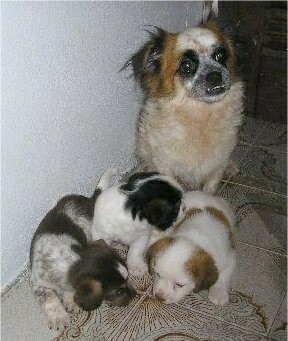 Domino (middle puppy) with his mother and littermates; there were three pups born in the litter. 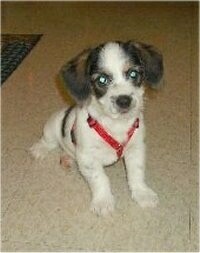 "This is my lovable but disastrous puppy. Her mother's owner told us she is a German Shepherd / Border Collie. Fortunately she shows all the signs of a German Shepherd Dog! This is Hailey-Bean at 4 months old pleading her case after eating my favorite cookbook as an appetizer."